Doorway tanks are polyethylene storage containers constructed at the maximum possible size to allow transport through conventional doorways and are typically stationary. Doorway tanks are also called wall tanks, closet tanks, and slimline tanks. They are designed to stand upright freely and do not require additional support. Main installation areas are along building sides and against walls. Doorway Tanks are specialized for residential and commercial applications, and can be customized per use. Common applications include water storage, irrigation, gardening, rainwater harvesting, chemical storage, and fire protection. Protank’s doorway tanks are manufactured in compliance with U.S. FDA regulation 21 CFR 177.1520 (1) 3.1 and 3.2 for potable water storage and consumption. They are made with food-grade virgin polyethylene resin that is safe for food and liquid. Protank’s doorway tanks meet or exceed ANSI and NSF 61 standards. 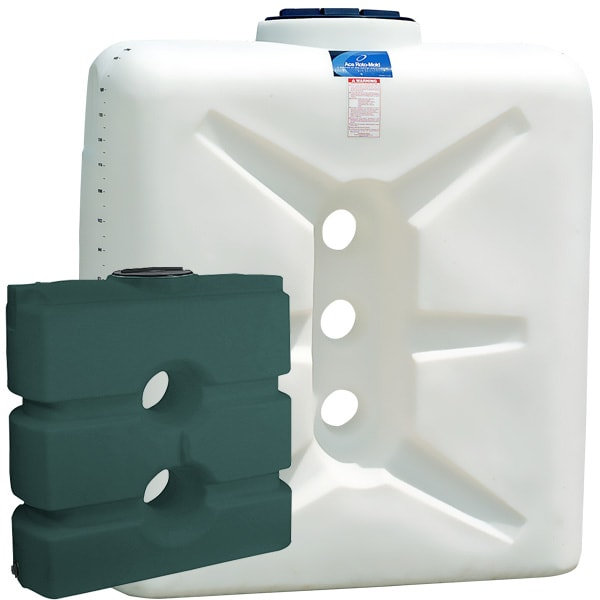 The polyethylene tanks are seamlessly designed, making them weather resistant and durable against cracks and punctures. Doorway tanks are constructed with UV inhibitors to resist direct sunlight damage. Installation can be inside or outside. Capacities range from 100 gallons to 1000 gallons and are installed with top mounted, vented manways and outlet drains at the tank base. Doorway tanks are engineered with 2 - 4 flat mounting areas for installing additional fittings, and are offered with a manufacturer’s 3 year warranty. Contact Protank about custom doorway tank fabrication, questions regarding chemical compatibility, or more information.